August | 2012 | WHAT A FEELING! In Wings of Desire, director Wim Wenders has created a beautiful visual universe, a unique world that somehow combines the lush black-and-white of such heavenly Hollywood fantasies as Here Comes Mr. Jordan with the more down-to-earth realities of Wenders’ modern Germany. It’s a world both rapturous and unfulfilling, lyrical but also sterile. Which are exactly the contradictions that Wenders wants. Wings of Desire is Wenders’ most magical film, an unexpected flight into Capraesque fantasy from the director of such angst-ridden modern-day movies as The American Friend and Paris, Texas. Wenders’ main character here (the screenplay is by Wenders and Peter Handke) is a melancholy angel, played by the superb Bruno Ganz. This angel spends his time watching people, jotting down their behavior in a notebook. He and the other angels, who dress in long overcoats and wear pony tails, pass through Berlin and observe, and are seen only by little children. These angels are immortal. They move through eternity, but they do not feel anything. One day Ganz commiserates with a pal angel (Otto Sander); “I’d like to feel some weight to me,” he says, and dreams of someday being able to touch and taste things, take off his shoes under a table and stretch out his bare feet. It is possible for these angels to take the plunge into the world of the living, but they would lose their immortality. Ganz eventually comes to the decision to become human, fueled in part by his infatuation with a trapeze artist (Solveig Dommartin); while watching her perform, he sees her in a brief, vivid flash of color (the cinematography is by Henri Alekan, who four decades ago photographed Cocteau’s Beauty and the Beast). Also on the scene is an American actor (Peter Falk), who is shooting a World War II movie in Berlin. Falk, who is called by his own name in the film and even subject to a couple of “Columbo” jokes, establishes an odd bond with the lonely angel. 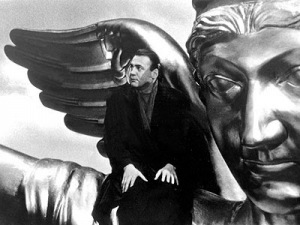 At two hours and 10 minutes, Wings of Desire is undoubtedly too long for any conventional telling of this story. But Wenders’ films do not bow to any conventional rules, nor should they. This movie drifts along at its own spellbinding pace, its languid narrative an inextricable part of its impact and meaning. The opening hour is a dreamlike survey of Ganz’ travels through the angel world. One of the most striking aspects of this existence is the angels’ ability to hear the thoughts of humans; thus the soundtrack is filled with the unspoken fears and dreams and desires of people. The movie becomes giddy when Ganz finally casts his lot with humans. Yet there’s nothing silly about his eventual encounter with the sad trapeze artist, or his conclusion upon sampling earthly reality that “It happened once, and so it will be forever.” One of the great things that this lovely movie communicates is the sense that eternity is going on right now. Must’ve run out of space, or I would’ve mentioned Nick Cave. This movie’s a beaut. Wolf at the Door chronicles two decisive years (1893-4) in the life of Paul Gauguin from his arrival back in Paris after painting in Tahiti, until his return to the South Pacific. It was, according to the film, Gauguin’s last fling at trying to live in civilization, and it was a complete failure. Gauguin is played by Donald Sutherland, who plays it intelligently, if never thrillingly. I suppose this performance is somewhere between a couple of previous cinematic approximations of the Gauguin character—the different approaches of Anthony Quinn in Lust for Life and George Sanders in the fictional The Moon and Sixpence. Sutherland does not attempt an accent or anything like that; the movie is a potpourri of nationalities before and behind the camera, as is the case with most international co-productions. At the lowest moment, an inheritance arrives, which will support his time in Paris. Gauguin tries to organize a colony of artists who will return with him to Tahiti, though this dream falls apart. He also dallies with many women, including a Javanese girl who models for him and shares his room. 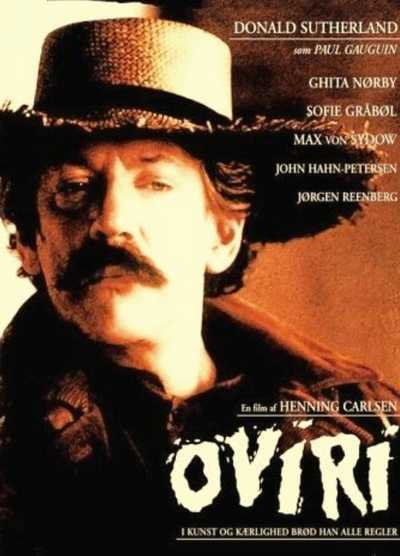 It is an interesting period in his life (it included an encounter with a cranky August Strindberg, played by Max von Sydow), and the movie is a trim enough telling of it. It’s seen through the eyes of a 14-year-old neighbor girl who idolizes and romanticizes Gauguin. The movie is essentially a Danish production, directed and produced by Henning Carlsen, a veteran Danish filmmaker. Carlsen’s Scandinavian scrupulousness keeps the film tidy and decent. But that approach is hardly suitable to deal to Gauguin’s raging primitivism, and a fuller account of the artist’s life awaits a gutsier, more romantic film—and, probably, a more volcanic actor. Henning Carlsen is still alive; he did adaptations of Knut Hamsen’s Hunger and Pan, 30 years apart. I’d watch this movie again, because the story of Gauguin is so hard to resist, but I do remember being disappointed by Sutherland’s take on the role. Francois Truffaut’s Confidentially Yours would like to be a good bottle of champagne: giddy, nutty and dry. But Truffaut may have left the cork out of the bottle too long. He’s been devoting his time to dark, serious movies lately—such as the little-seen The Green Room and The Woman Next Door—and perhaps he’s forgotten how to create his special kind of magic. Not that Truffaut has ever been merely bubbly; but even in primarily dramatic movies such as Jules and Jim and Day for Night, he conveys a wonderful sense of the joys of life and the movies, although those joys sometimes turn out to be fleeting. Confidentially Yours self-consciously tries to recapture some of the magic; it’s a knockabout whodunit, with lots of clever twists and turns and a pair of engaging performances from Fanny Ardant and Jean-Louis Trintignant. It’s being pushed as a kind of homage to the American film noir genre that Truffaut loved so much when he was a young film critic. Actually, this movie doesn’t bear much resemblance to the feverish fatalism of film noir; it’s much more of a lark. And Truffaut has always been too loose-limbed a director to really recreate an American style, which he tries to do periodically. He’s much more successful on his own idiosyncratic turf. Anyway, Trintignant plays a businessman who is accused of murder. The evidence is persuasive: First his wife’s lover is found shot to death; then just a few hours later, Trintignant’s wife is herself the victim of the killer. We can’t be absolutely sure that Trintignant is not guilty; that’s part of the tease. So the focus shifts to his feisty secretary (Ardant), who determinedly sets out to find the murderer herself—while the boss hides out in the rear of his realty office. Misadventures ensue as Ardant somehow bumbles her way to the solution. 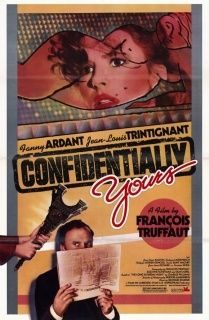 Confidentially Yours is something of a showcase for the leggy Ardant, who is Truffaut’s current discovery. She gets to go undercover, crack wise, and generally handle herself as a Rosalind Russell-style girl Friday, whose combative relationship with her boss may be hiding more affectionate feelings. She proves more resourceful than the local police—who aren’t amused when she keeps turning up at the scenes of murders. If the police are not amused, the viewer may be, as Truffaut alternates the detective work with whimsical interludes. It’s all sort of cute and predictable, and it’s enjoyable as a cat-and-mouse exercise, if a rather flat one. But Truffaut seems to be trying a bit too hard to make up for his recent moody work; as though he were nudging the audience and saying, “See? I can still be charming.” There were times when I had the feeling we were being clobbered over the head with light-heartedness. And that isn’t a good feeling. 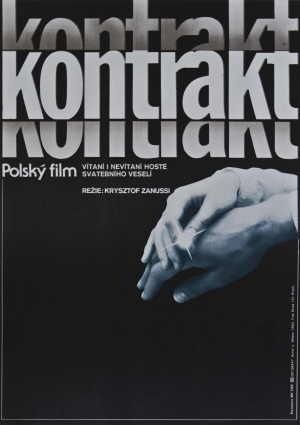 Truffaut did not survive the year, and this was his last film, although nobody knew that at the time. I have never watched it again. If it’s not one of his best films—and his best films are among the best anybody ever made—at least it stands as a tribute to a woman, and a tribute to movies, which are two things Truffaut knew something about. I think I know what I mean by “loose-limbed” style, even if I don’t express it particularly well in the space of a newspaper review. Truffaut was rigorous, but even when he would do a Hitchcock or a science-fiction picture (or a film noir, as in Mississippi Mermaid), the results didn’t really resemble the work of his models, but they did look like Truffaut movies. 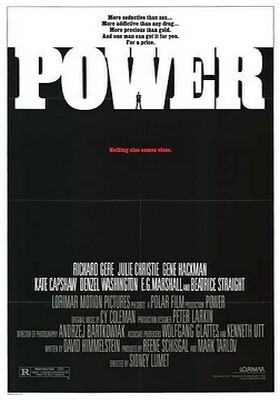 Power is one of those behind-the-scenes peeks at the wheeling and dealing of political campaigns, always a ripe subject for movies (after all, so little madness needs to be invented). As it happens, Power is not an unusually distinguished essay on the cutthroat gamesmanship that we all know and love, but it’s certainly enjoyable enough. The main player in this drama is Peter St. John (Richard Gere), a high-stakes public relations wizard with an 85 percent success rate with political candidates. He is introduced to us in a series of glimpses at his various projects. First, he’s attending the speech of a South American candidate/client, whose rally is suddenly interrupted by a terrorist bomb. When the candidate gets a little blood on his shirt, St. John rushes over with his camera crew, fairly exultant with the public relations possibilities. He excitedly tells the candidate to wear the blood-stained shirt at every subsequent public appearance. Next, St. John is off to New Mexico, where he oversees the candidacy of a Senate hopeful (Fritz Weaver), then to Seattle for a meeting with the incumbent governor (Michael Learned, once the mother on “The Waltons”). She needs special help in smoothing over her recent divorce, and its impact on the fall campaign. But St. John’s most pressing public relations gig is the Ohio Senate race. The incumbent (E.G. Marshall), an old friend, pulls out of the running, abruptly. St. John is pursued by a mysterious power broker (Denzel Washington of “St. Elsewhere”) to back another Ohio candidate, one whose resources are vast, but whose intentions are suspect. In other words, quit worrying about the issues and concentrate on the makeup and the hair. St. John creates the kind of devious TV commercials and publicity ploys with which we’ve become all too familiar over the years. But strange things are happening: St. John’s rooms are bugged, his plane is searched, and his ex-wife (Julie Christie), a reporter, is finding some fishy finances connected with Marshall’s wife (Beatrice Straight). It all sounds complicated, and it is, but it’s enjoyably mounted. Sidney Lumet (and his fine photographer, Andrej Bartkowiak) can orchestrate this sort of intricate setup with clarity, if little subtlety (The Verdict and Prince of the City are other examples). And he recognizes the satire of much of David Himmelstein’s script. Gere is well-cast as the shallow media hypester, although he does less well with the character’s moral awakening. Gene Hackman does some tasty work as Gere’s friend/competitor. Kate Capshaw is attractive decoration as Gere’s assistant. It’s the kind of aggressive slickery that, by rights, ought to make Lumet, Himmelstein, and co., just a bit queasy. It didn’t land like Network, that’s for sure. The political stuff looks like child’s play from a perspective 25 years on, and sort of looked like child’s play then. Karl Rove, where were you in ’86? Let’s get the official tsk-tsking out of the way: Road House is a violent, tasteless, unbelievable movie that has no redeeming social value whatsoever. With that said, we can talk about how much fun it is. Road House is shameless, but it’s also irresistible. Patrick Swayze, who hasn’t had a film released to theaters since he struck gold with Dirty Dancing two summers ago, stars as “the best cooler in the business.” Translation: he’s a glorified bouncer who gets hired at bad clubs and bars and turns them around. He weeds out the deadbeats, throws out the drunks, chases the dope dealers. After an opening sequence in which we see his brand of Zen pugilism (he sews up his own wounds), Swayze is hired to manage a rundown roadhouse in a small town outside Kansas City. After he arrives and begins to clean the place up, he comes to realize that the town is run by an evil landowner (Ben Gazzara), who has his hands in everybody’s pockets and his goons on everybody’s backs. Inevitably, Swayze is going to have to teach this guy a lesson and make the town safe. Swayze receives a bit of help from his mentor, the now-graying king of the bouncers (Sam Elliott, who has played a few cowboys over the years, in a sly performance). The movie skillfully mixes Swayze’s martial arts, his philosophizing (“Pain doesn’t hurt,” “Nobody wins a fight”), some kissy face, good roadhouse music, as well as at least one fistfight every six minutes. It doesn’t come close to being respectable, but Road House is a brawling good time. I know what you’re thinking: I underrated it. True. Some movies hit the sweet spot where the ridiculous becomes sublime; Road House, you are it. 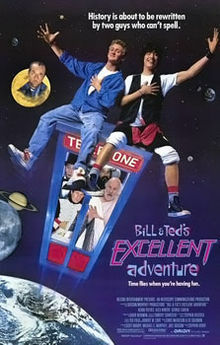 Bill & Ted’s Excellent Adventure is a little like the old “Rocky and Bullwinkle” show. You know the thing is aimed primarily at 11-year-olds, and the characters are all idiotic, but jokes keep whizzing past that are neither idiotic nor pre-adolescent. In fact , this movie is pretty funny. But where “Rocky and Bullwinkle” was sly, Bill & Ted is goofy. It makes certain demands on the viewer; you’d better have a high tolerance for cretinous dialogue and vacant, glassy-eyed stares. Bill and Ted (played with unfailing vacuousness and in perfect Valley-speak by Alex Winter and Keanu Reeves, respectively) are two high-schoolers who are flunking out of history class. When the teacher asks who Joan of Arc was, they’re stumped: “Noah’s wife?” And they wonder whether Marco Polo refers to a watersport. For some reason, these two dorks are chosen by an emissary (George Carlin) from the 27th century, who lends them a time machine in the form of a telephone booth. With this, they’re able to travel around through the centuries, pick up interesting historical figures, and come back in time to present a really bodacious final report, and thus avert the most dreaded F.
That’s the concept. And there aren’t many complications along the way. The movie, written by Chris Matheson and Ed Solomon and briskly directed by Stephen Herek, touches down in a variety of historical locales but never stays long enough for anything to get stale. From the wild West, the boys take Billy the Kid; from ancient Greece, Socrates (“a most bodacious philosopher”). They grab Joan of Arc, Napoleon, Lincoln, and Sigmund Freud (who is greeted in the Vienna of 1900 with a friendly, “How’s it goin’, Frood-dude?”). There’s also room for some low comedy when the time travelers return to the presnt and deposit the great figures in a shopping mall. Billy the Kid and Socrates try to put the make on a couple of babes (this doesn’t sound like the Socratic method), but Freud ruins things by showing up at the wrong moment, corndog in hand (though sometimes a corndog is just a corndog). “Way to go, egghead,” Billy snarls. The movie’s characters are so moronic they become strangely endearing after a while, and it’s all over before it wears out its welcome. In short, most bodacious. A genuinely funny movie. I guess I couldn’t figure out a way to make the duo’s pronunciation of “Socrates” understandable, which is a shame. And just a few days ago, Reeves announced that he’d signed on for a new sequel, which might be a good idea if only to alter the memory of the DOA Bogus Journey. You are currently browsing the WHAT A FEELING! blog archives for August, 2012.